Shelf Reliance is offers a variety of THRIVE foods in many shapes and sizes. Each size fits a different need I (you) have. Mylar Bags-- just the right size to stash in my purse or diaper bag. Perfect for on the go snacking. 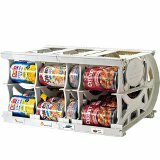 Pantry Cans-- perfect for storing in the kitchen pantry. Pantry cans are approximately the same size as a small coffee can and hold about 2 1/2 cups of product. #10 cans-- or gallon size. 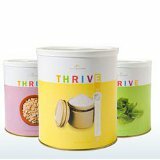 The #10 can contain plenty of servings of healthy THRIVE food that you can use daily to whip up a variety of tasty homemade meals. But what about the things I really need a lot of? Can I buy it in an even bigger size? Yes (very soon). I'm so excited about these bigger sizes. For those of us with hungry boys living at home this is the perfect solution. I don't have any specifics yet. But I'll keep you posted.